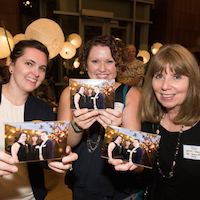 Webster University alumni, parents, students, family, friends and the community are invited to the Webster Groves campus for Homecoming: Reunion & Parents Weekend on Sept. 23 – 24, 2016. Shop, Rock & Glow Festival: Art booths and live performances are part of this expansion of the popular Garden Glow opening reception. Featuring alumni, student, faculty and staff vendors, this event will showcase why Webster rocks! Siblings Night Drop-off: Siblings (ages 14-18) are invited to join their older brother or sister on campus to discover what college life is like at Webster. They will sleep in the dorms, eat in Marletto’s and enjoy the rest of the weekend’s activates. Yoga on the Quad: Gladys Smith, assistant director of the Counseling & Life Development Office is leading a free yoga class on the Quad. Please bring your own mat and bottle of water. Click here to read more information about the newest inductees to the Student Life Hall of Fame. Click here to read more information about the Alumni Award winners. For a full schedule of events and to RSVP, visit the Alumni website.